For this start we decided on the largest spinnaker as we reckoned the wind was going to stay just aft of the beam all the way to North Head, no whimping with the 90%. We had a good start with the kite going up as the gun went. It took a bit of time to get the spinnaker drawing properly as we had a bit of trouble deciding which bit of string was the spinnaker guy (we had never used the heavy sheets before!) For a time we lead the fleet. Girolle and Domaine went through to leeward, Mack the Knife to windward. Xara started to overtake close to windward and we stuck to her stern wave for a time but not long enough as she climbed away to windward. Across the bay to North Head we struggled occasionally to keep to the required bearing and as we approached the buoy had to resort to the #1 genoa to make the mark. Once round we re-hoisted the spinnaker and hadn't lost much in the short time without the big sail. On the run to Hurst the wind died to next to nothing and to our horror the boats we had spent over an hour creeping away from across the bay came up and passed us in a new wind! At Hurst it was kite down for the fetch to the finish line. Our first target was to get back in front of Blazer who had overtaken us in the wind hole, this we accomplished reasonably quickly. Next target was Pastime of Hamble who had also got through in the wind hole. We very slowly crept up to her but could never quite get passed, an opportunity arose near the finish as she allowed herself to be swept North of the line to the finish by the tide out of Gurnard bay but we only managed to get our bow a foot or so behind hers, official gap was three seconds, it definitely looked like a short head to me. 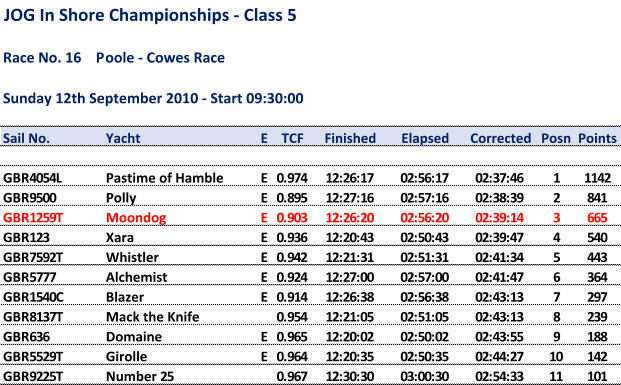 Polly came in very close behind giving them second behind Pastime of Hamble with us third. A very quick race and no time in adverse tide. Very many thanks to the race officers both for this weekend and the whole season of inshore races. The weather this year has been very Laser 28 compliant so we have had our best ever season in 15 years or so of JOG inshore racing on our own boat. We doubt that we will ever repeat the feat of four race wins and a third to count for the series.